However, there are ways to get a cheap descent lightweight kit. Maybe for family members who rarely, but occasionally join you on hikes. Or friends that are showing an interest in hiking, but don’t want to spend a small fortune before they even know if is for them. On Reddits UL-forum there is a constantly changing lighterpack gearlist with ultralight affordable alternatives. I put together a version for a somewhat complete gear list for a price of around $300 and a weight around 3000g using parts of the Reddit gearlist. Most of it is from AliExpress. I’ve bought both an Aegismax Wind Hard quilt (496g / $80) and an Aegismax G1 mummybag (692g / $94) for the occational times my wife or any of my kids join me. Concerning the ethics I read a post on backpackinglight.com earlier this year that they are supposed to use down from the same source as the rest of the major companies that have their manufacturing in China. I also bought a down puffy ($21), a foldable sleeping pad ($18) and the 3F frameless pack (950g / $43) for my wife. You do however skimp on quality. The low cost comes with that. 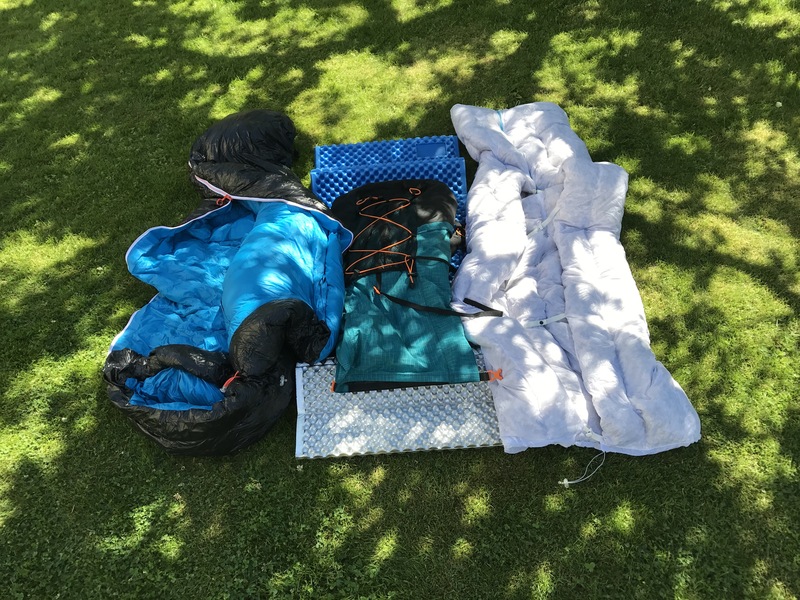 There have been reports that the fabric in the sleeping bag and quilt doesn’t breath well, which makes you sweat, and in the end will leave you colder. They’ve changed the fabric on the sleeping bag, but it didn’t appear to be fully down proof as down seems to seep through the fabric. The quilt also has sewn through baffles, but I plan to use these primarily during the summer. But I might also use the quilt over my winter sleeping bag if the temperatures drop as much as they did on my January overnight trip. In most cases I’d say that more expensive gear from known quality brands will give you better products. And I like to support the cottage industry. But if you, like me, want to get a lightweight setup for family members without having to spend a fortune on gear that seldom gets used, it’s nice to have a cheap option. Would you mind to share with us your first comments (or better your wife’s comments) on the 3F backpack? It was ok, and I think it was of descent quality. The waistbelt was very padded though, and I think that the point where it’s sewn to the pack is the weak spot, and the place that will wear first with heavier loads. Other than that I think it’s a very nice pack for 45€. But I ended up buying the HMG Southwest after all, since I wanted more space for two weeks worth of food, so my wife use my Exped Lightning instead (A REALLY great pack imho) so I might end up selling the 3F after all, or just keep it as a loaner.